Shortened URL services like bit.ly are incredibly convenient, right? They allow you to take an unwieldy, lengthy (and let’s face it - ugly) URL and transform it into a short, manageable URL with just the click of a button. You can even view quick stats to learn how many clicks your shortened URL received. What many marketers and social media experts don’t realize is that major problems can occur from mindlessly shortening URLs to share on social media. You’re impacting the central data for your website in Google Analytics, which is much more important (and telling) than any one-off analytics data you’ll receive from that URL shortener. In fact, relying on URL shorteners to aid the social management process can ultimately hurt social media in an organization and downplay its value by eliminating important social traffic data in Google Analytics. If your boss or client sees skewed results - fewer sessions and conversions from social media than should be attributed -- it may be decided that social media is something he or she no longer wishes to continue. So, how exactly does this happen? Let’s take a look at the results from an infographic that was promoted primarily via social media with a shortened URL. The stats are segmented by Source/Medium for a specific landing page. As you can see, Google Analytics shows the primary source as Direct, with only three clicks coming from Twitter (note that in this case the source showed up as twitter.com, possibly from a URL tagger as will be explained later, but generally Twitter links show up as t.co). Wow, not an impressive Twitter showing, huh? Well, let’s take a look at bit.ly’s analytics for the link. Bit.ly shows 47 clicks coming from the shared link. Granted, some differences will occur between bit.ly and Google Analytics (the GA view shown below filters out sessions from some IP addresses, and bit.ly is less restrictive about tracking bot clicks) but, it’s safe to say most of the 44 direct sessions recorded have been misattributed and are a result of users clicking on the link via Twitter, not visiting the content directly. This means the content received many more sessions from Twitter than was reported. Because direct traffic lumps together any sessions where Google could not identify a specific source, you can see how easy it becomes for a URL shortener to hurt your ability to track a proper source. In the process of redirecting the URL from the bit.ly link to the yoursite.com link, the source gets lost and is seen simply as a direct visit. Some shorteners like Twitter’s t.co will pass on the referral source properly, but you can’t always trust the source to come through on its own. In addition to not showing correctly in referral reports, social visits from shortened URLs won’t be counted in the Social section of analytics. 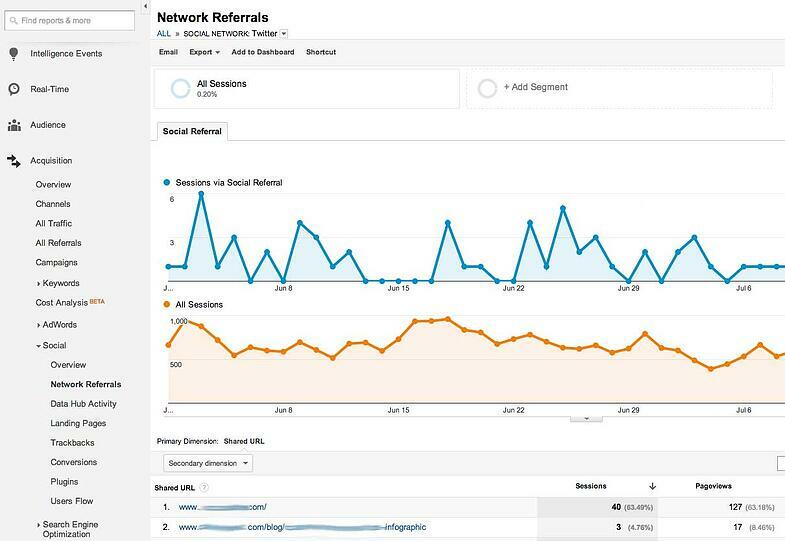 Marketers can use this section to get an excellent peek at sessions, conversions, and other stats from social media referrals but is useless without proper data. The screenshot below shows referrals from Twitter in the Social > Network Referrals report, after clicking on Twitter to segment specifically to that channel. The second link on the list is the same infographic from the previous report, with just three visits reported here as well. Now that you’ve seen the negative effect URL shorteners can have on your GA data, how can you ensure this doesn’t happen to you and that you get accurate data from links you share on social channels? First of all, you don’t necessarily need to shorten links in the first place. By using the true version of the URL, you’re most likely to see the proper source when users click the links. Twitter automatically shortens URLs via t.co, so you don’t have to worry about lengthy URLs eating up your character limit. For example, in this referral report t.co represents visits from Twitter. Shortened URLs also aren’t really an issue for Facebook, which allows a long enough character limit in posts to make shortening them unnecessary. Also, there’s little need to care about the extra analytics you can get from shortened URL services as long as you have access to Google Analytics which provides more extensive and more accurate data anyway. However, you may still prefer to use a URL shortener. Maybe you’re concerned about lengthy URLs looking messy on Facebook. You can still use a shortener and get correct analytics data, as long as you tag your links with campaign parameters before shortening. Even if you’re not using a URL shortener, tagging URLs before sharing is a good practice to establish. Referral data often gets lost for various reasons, especially for mobile visits (see this article for more details). When you tag your campaigns, you don’t have to rely on the app or browser to correctly send referral information to Google Analytics. Because a tagged URL can look exceptionally long and unwieldy when appearing in a social media post, tagging combined with a URL shortener makes a smart approach. To add these parameters, head on over to Google’s URL builder. This example shows the process of preparing a custom link to share a recent Megalytic blog post on Twitter. First, paste your URL into the “Website URL” field. Next, insert the social network where you’re planning to share the link into “Campaign Source” (in this case twitter.com for Twitter). Medium should be broader than the specific site/source; in this example, “social” will tag any link shared to social media. The “Campaign Content” field is not necessary, but we’ve included an abbreviated title for the article being shared to show extra info in analytics. 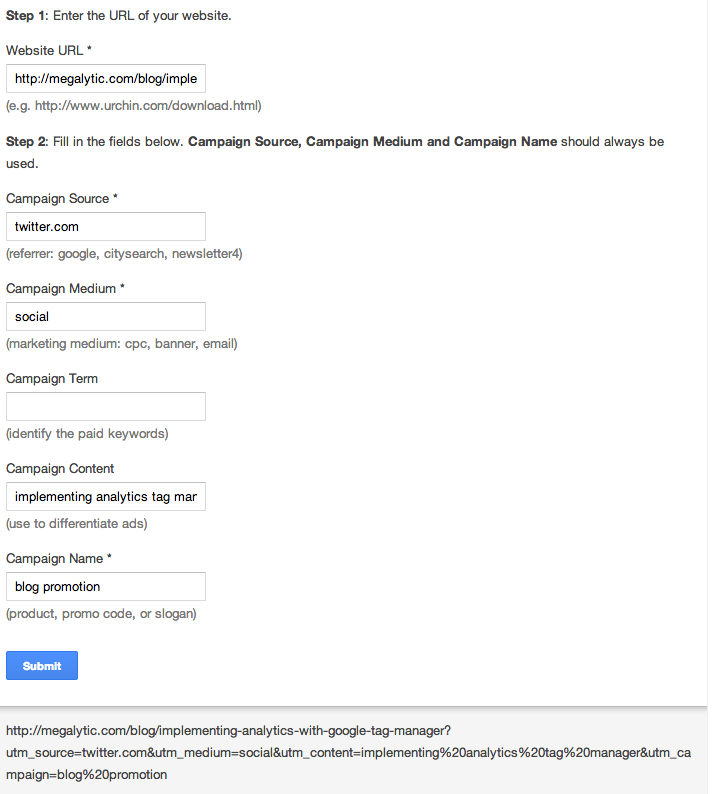 Finally, the “Campaign Name” is a more general category we’re using for any links shared to the blog. Click “Submit,” and you’ll see a final URL you can then copy. Paste that version of the URL into your preferred URL shortening service and generate your shortened URL. That URL (for example, bit.ly/*****), will then forward to the final link with all the proper tracking parameters tacked on. This will allow you to see visits accurately attributed to Twitter, as they should be. Note that some social sharing services offer an option to automatically tag URLs. However, Annie Cushing points out that some tools add inaccurate tags, causing just as much damage to your data as not tagging URLs before shortening. You’ll want to ensure that the tool you use adds the proper tags; if not, you’re better off turning off auto-tagging and manually adding the parameters. In summary, you’ve seen the dangers of using shortened URLs without properly tagging them first. Don’t make the same mistakes with your social sharing, and ensure that your analytics data is coming through accurately. Make a plan with whoever manages your social media to either stop shortening URLs or else add tags before shortening.